In 1871 the following notice appeared in the Brooklyn Daily Eagle, 16 March 1871, pg. 1, "Notice is hereby given that the late firm of Corwin & Read having been dissolved by the death of Mr. George W. Corwin, the business will be hereafter conducted by the subscriber, who is authorized to settle the accounts of the late firm and sign in liquidation. - Brooklyn, February 1, 1871. William Read, Corner Water and Jay sts." 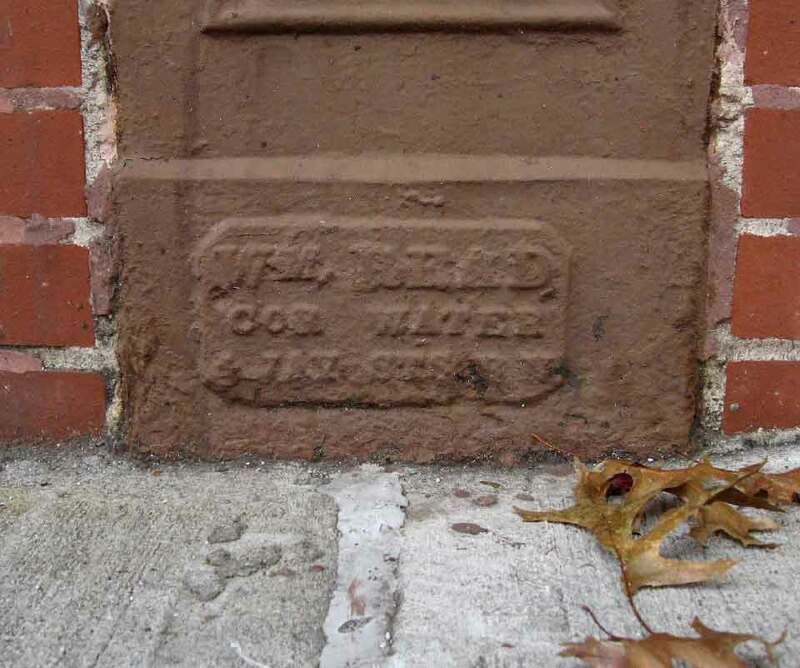 William Read "Water c Jay" is listed under "Iron Founders" in Lain's Brooklyn City and Business Directory of 1874-75. The streets referred to are in Brooklyn, in the area now (2014) called DUMBO (Down Under the Manhattan Bridge Overpass). The William Read foundry continued to be listed at this address through 1894. Read himself is found in the 1870 U. S. Census, age 47, born England, "Iron Foundry," living at dwelling 64, family 82, in Brooklyn's Ward 2. A son, William Henry Read, age 21 in the census, seems to have succeeded his father in the business in the late 1880s. Both William Reads are found in the 1880 U. S. Census. The elder, now 57 years old lived at 120 Prospect Street, Brooklyn. His son, William H., had his own family by then, and lived at 118 Bergen St., Brooklyn. William Read (1823?-1888) died by 1888. Notice appeared in the Brooklyn Daily Eagle, 5 Oct. 1888, pg. 5, as follows, "Read - In this city, October 3, 1888, William Read, aged 65 years. The relatives and friends of the family and members of Zoredatha Lodge No 483, Nassau Chapter No. 109 and the Brooklyn Volunteer Firemen's Association are invited to attend his funeral from his late residence, 120 Prospect street, on Saturday, October 6, at 2 o'clock P.M."
William Henry Read (1849-1905) appears in the 1900 U. S. Census, but by that time he was employed as a "Street Inspector." The foundry seems to have shut down by 1895. On his death the following appeared in the Brooklyn Daily Eagle, 6 June 1905, pg. 2, "After a brief illness of three weeks, William H. Read died at his residence, 576 McDonough street, on Sunday evening. Mr. Read was born in Brooklyn on February 2, 1849, and has resided here all his life. He was a son of William Read. When a young man he was associated with his father in the iron business carried on by him at Water and Jay streets. Upon the death of his father, Mr. Read was employed by the Department of City Works and later resigned to accept a position as supreme court attendant, which position he occupied until his death. He was a member of Clinton Lodge, Knights of Honor and of the Association of the Courts of Record. Funeral services will be held at his late residence, to-morrow at 8 P. M. The interment will be in Evergreen Cemetery. A wife and daughter survive him."